Painters’ Paintings’ at the National Gallery utalises familiar gems from the permanent collection set alongside rare treats from elsewhere. This exhibition re-assembles artist’s own art collections and there are many discoveries to be made. One such discovery is in Matisse’s collection, a finely observed portrait by Gauguin. It was probably painted during ’s Gauguin’s first trip to Tahiti (1891-93). The portrait depicts his handsome friend Jotepha. Gauguin has created exquisite colour combinations. Distinctive patches of Cobalt verging on Prussian blue build up the background, carefully matched against the warm tones of the face and dark hair matched with a funky a pink shirt below! The head is rendered in precise richly coloured planes with edges sharply defined. It is tactile and sculptural and doesn’t take much to imagine putting ones hand on the face as it turns round into the back of the painting. Gauguin gives us quick shifting tiny facets around the mouth and then larger almost geometric areas which together create this tangible young man. Gauguin’s work is distinctive. This portrait has the Gauguin “look” to it but it also reveals the analytical side to his painting, something that pre-empts Euan Uglows’ much later works and is reminiscent of Paul Cezannes’ paintings. Indeed, Gauguin collected a number of Cezannes’ paintings when he was in Europe and the two artists were friends. “…it sustained me morally in the critical moments of my venture as an artist. I have drawn from it my faith and my perseverance”. What this show reveals is an endless web of influences, ideas and connections that run through artists and their works of which I have chosen a tiny snippet. As Lucian Freud once admitted “I ignored the fact that art, derives from art. Now I realise that this is the case”. 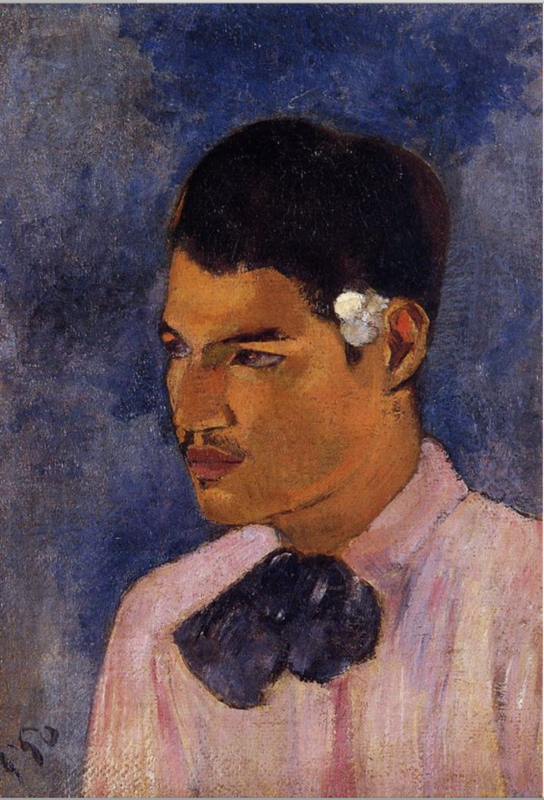 Paul Gauguin,Young man with a flower behind his ear, Long Museum, Shanghai.